Senate Democrats yesterday lashed out at their House GOP counterparts for resisting efforts to revisit a host of expired energy tax breaks in ongoing omnibus negotiations. Meanwhile, tax writers across the Capitol called on affected sectors to justify why their respective breaks should continue in a post-tax reform world. Sen. Maria Cantwell (D-Wash.), the top Democrat on the Energy and Natural Resources Committee who also sits on the Finance panel, unloaded on House Republicans for opposing the addition of extensions for efficiency, alternative vehicles, biofuels and other incentives in omnibus spending talks. “We’re just in this very draconian world over there that the tax bill was everything even though everybody knows it has many, many problems,” Cantwell said yesterday at the American Council on Renewable Energy (ACORE) Renewable Energy Policy Forum, after being asked about the prospects for extenders in the omnibus. She said there was bipartisan “anger” toward the House for its “stingy” approach to tax extenders for renewable sources, referencing the fact that last month’s budget deal largely only retroactively extended many incentives for 2017. A proposal floated by Republicans on the Senate Finance Committee would have extended the breaks for both 2017 and 2018 but was rebuffed by House GOP opposition (E&E Daily, Feb. 9). “You can ask Dean Heller or Chuck Grassley or anybody else and they will give you that viewpoint,” Cantwell said, referencing her Nevada and Iowa GOP colleagues on Finance, both of whom support renewable sources that are economic mainstays in their home states. Sen. Ron Wyden (D-Ore.), the ranking member on Finance, declined to comment on whether extenders were still in play for the omnibus, citing ongoing negotiations. But he too alluded to internal GOP divisions on the issue. Sen. John Thune (R-S.D. 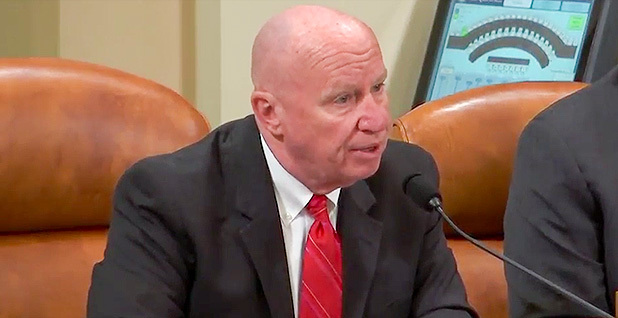 ), a member of the Finance Committee who supports longer extensions for the assortment of expired tax breaks, said yesterday that while a handful of tax matters remain alive in negotiations with the House, they would probably likely be limited to a fix to how the new tax law inadvertently affected agricultural cooperatives. “I think it’s going to be very narrow,” Thune said. Sen. Ben Cardin (D-Md. ), who also sits on Finance, said he would like to see energy extenders included in the omnibus but noted that Republicans will likely need to make additional changes to clean up mistakes in the tax law. “They need a technical corrections bill badly here,” he said. Cantwell also suggested that the extender push was likely to be punted to a later debate over reauthorizing the Federal Aviation Administration, which has previously devolved into a food fight over unrelated tax extenders (E&E Daily, April 6, 2016). Meanwhile, the House Ways and Means Subcommittee on Tax Policy yesterday heard hours of testimony from various energy sectors on the importance of their respective tax incentives (E&E Daily, March 12). “We’re going to take a close look at each of them … and ask ourselves: Are these provisions truly needed in a modern tax code?” Brady asked. “Do they amplify and complement the growth and competitiveness provided by the new tax system? If the answer is yes, what other tax provisions are stakeholders willing to give up to make extenders permanent or a long-term part of our tax code,” he said. Subcommittee Chairman Vern Buchanan (R-Fla.) took a similarly dim view of the on-again, off-again tax breaks. “Contrary to our focus in tax reform on providing broad tax benefits for all taxpayers like rate reduction and full expensing, many of these expired provisions are targeted very narrowly to encourage specific activities or industries,” he said. Nonetheless, Buchanan said he had invited any group wishing to testify to do so, leading to 20 witnesses spread out over four panels, who were peppered with questions throughout the day. Some Republicans had tough questions, including Rep. Tom Rice (R-S.C.), who questioned the need for alternative vehicle breaks. Such incentives were intended to reduce risks from dependence on foreign energy sources, a purpose he said no longer makes sense given changing global energy dynamics. “We’re producing more oil than we ever have,” Rice noted. But other Republicans on the panel expressed support for expanding some green incentives. Rep. Jim Renacci (R-Ohio), for instance, lamented that a 2015 tax deal that extended and phased down over five years the renewable and investment production tax credits omitted sources such as biomass, hydropower and waste to energy. “We need to do something to put these competing technologies on an even playing field with each other,” he said. Lisa Jacobson, president of the Business Council for Sustainable Energy, took advantage of the opening to highlight legislation, H.R. 4137, by Rep. Elise Stefanik (R-N.Y.) that would allow additional technologies “that right now are basically at a competitive disadvantage” to qualify. Former Rep. Rick Lazio (R-N.Y.), the senior vice president of Alliantgroup, which helps private companies utilize state and federal tax credits, called for support for efficiency incentives, which are currently expired. “We’re lowering the cost of government, we’re helping taxpayers,” he told the panel. While they did not testify yesterday, representatives of two groups affiliated with the billionaire Koch brothers’ political network also weighed in with the panel, arguing that giving the extenders new life would undercut last year’s historic tax reform law. “Adding billions of dollars in expired corporate welfare provisions back into the tax code after tax reform has passed would needlessly weaken the most significant legislative achievement in more than 30 years and send the wrong signal to special interests that Washington is back to business as usual,” wrote Freedom Partners and Americans for Prosperity to the subcommittee.